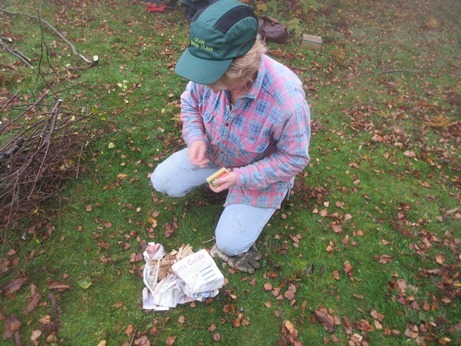 This was our second visit to May Hill for us to continue with the Birch clearance. It was the weirdest day because the fog was so intense that everywhere was creepy and eerie! Actually, in some respects it was quite magical and the faint sight of a horse rider cantering along the hill in the fog was spooky! It is not often that one of the girls light a fire! Could this be because the men don't think we can do it? Even in the wet fog with sodden branches our fire did not go out at all! 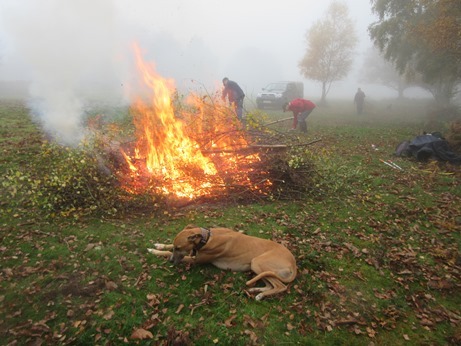 Charlie, the lurcher, decided to have a warm up by the fire! This shows the fog in the distance. We were a smaller team than usual owing to the day being split between May Hill and Darkhill Iron Works. 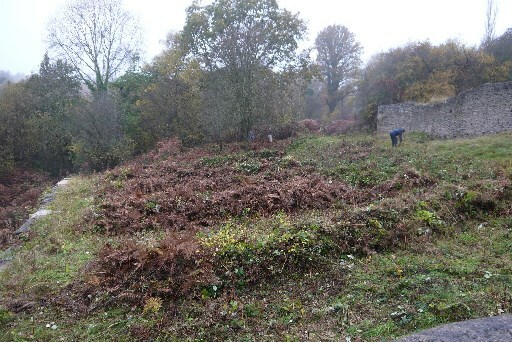 It was significant that the majority of the May Hill volunteers lived on the north and east of the Forest of Dean and the Darkhill volunteers lived south and west. Sensible choices for all! On the same day another group went out to Darkhill Iron Works where the weather was rather damp and midges were bad. 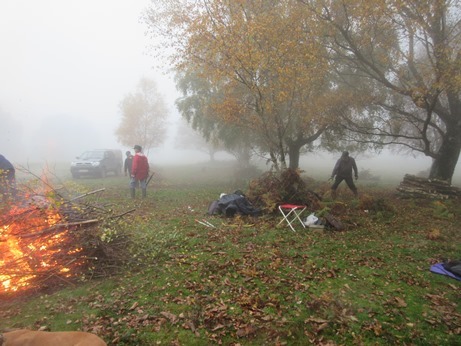 This team also split up so that some were removing birch and others were raking the bracken into long piles. 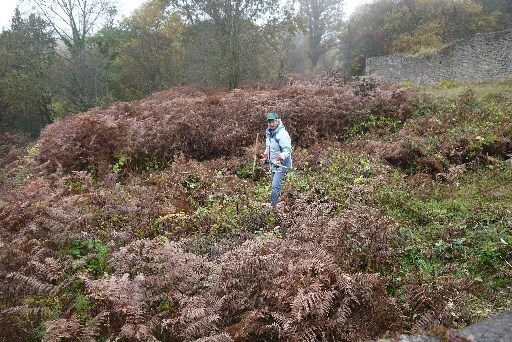 The bracken below the old walls is invasive but does provide good cover for the reptiles and invertebrates. A good variety of wild flowers have been established though and if we can get the habitat right it might be possible to get some butterfly larva to top-up the gene pool! We cut and raked into rows of brash to make corridors which continue to give shelter to small creatures within it.